Utu (Akkadian rendition of Sumerian dUD 𒀭𒌓 "Sun") later worshipped by East Semitic peoples as Shamash (Akkadian šamaš "Sun" is cognate to Phoenician: 𐤔𐤌𐤔 šmš, Classical Syriac: ܫܡܫܐ šemša, Hebrew: שֶׁמֶשׁ šemeš and Arabic: شمس šams) was the ancient Mesopotamian god of the sun, justice, morality, and truth, and the twin brother of the goddess Inanna, the Queen of Heaven. His main temples were in the cities of Sippar and Larsa. He was believed to ride through the heavens in his sun chariot and see all things that happened in the day. He was the enforcer of divine justice and was thought to aid those in distress. 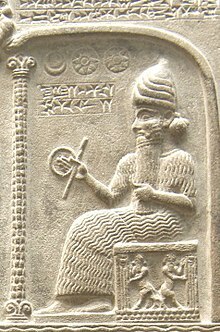 According to Sumerian mythology, he helped protect Dumuzid when the galla demons tried to drag him to the Underworld and he appeared to the hero Ziusudra after the Great Flood. In the Epic of Gilgamesh, he helps Gilgamesh defeat the ogre Humbaba. The messenger gave heed to the words of his king. He journeyed by the starry night, and by day he travelled with Utu of heaven. All the yarns of Uttu, the splendour of kingship, belong to me. You should not question the words of your mother and your personal god. The mother, like Utu, gives birth to the man. Ancient Mesopotamian Gods and Goddesses: Utu/Šamaš (god) at Open Richly Annotated Cuneiform Corpus (Oracc) - University of Pennsylvania.